Selecting the right vacuums can make a significant difference on your guests’ stay, especially for those who suffer from allergies or asthma. According to the Allergy and Asthma Foundation of America, as many as 30 percent of adults and 40 percent of children suffer from some form of respiratory allergies and asthma. That means three of every 10 guests who check into your hotel may be susceptible to dust, dust mites, breathable irritants or pet dander at a time when hotels are rapidly embracing pet-friendly accommodations. Susan Smith, the founder of Pet Travel, Inc., estimates there are more than 35,000 hotels, bed and breakfasts and other lodging facilities in the U.S. that accept pets. Fortunately, there are programs that can help guide vacuum selection that rates vacuums on the basis of soil removal and dust retention. 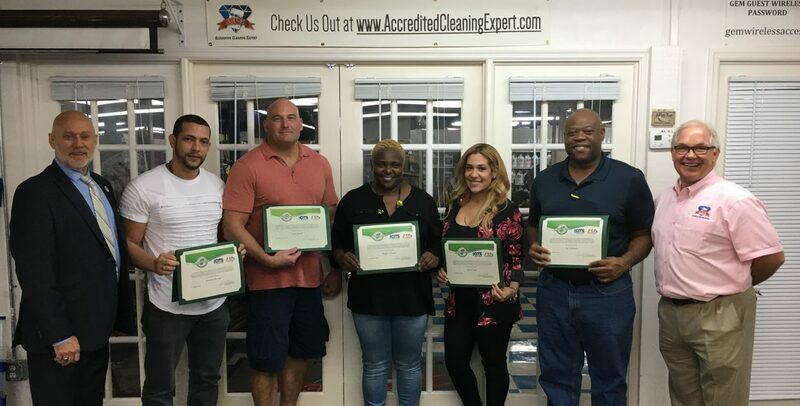 The Carpet and Rug Institute (CRI) Seal of Approval program offers three levels of certification for vacuums — Gold, Silver and Bronze, with each level determined by third-party test results for soil removal, dust containment and carpet preservation capabilities. A CRI Gold certified machine removes more than 55 percent of soil from carpet and emits less than 35 micrograms of dust per cubic meter of air. A CRI silver-rated vacuum removes 50 percent or more of soil and emits less than 100 micrograms per cubic meter. To earn a Bronze rating, a vacuum must remove 40 to 49 percent of soil and emit less than 100 micrograms of particles per cubic meter. The U.S. Green Building Council (USGBC) also sets a limit of 70 decibels for operating sound and a CRI Gold rating for vacuums to be approved for LEED Green Cleaning. The Sanitaire® EON™ QuietClean® is a reliable, durable vacuum that meets both CRI Gold and LEED standards, delivering an exceptional clean without disturbing guests. It includes a top-mounted, easy-access, washable HEPA filter and numerous user-friendly features, like side-mounted compartments for easy, tool-free removal of clogs and replacement of brushrolls. A quick-change pigtail power cord prevents downtime and repair costs for power cord replacement, ensuring a low cost of ownership. Operating at just 68 decibels, the CRI Gold certified Sanitaire® EON™ ALLERGEN upright also allows for quiet daytime cleaning that meets LEED standards. In addition, this machine is the first commercial vacuum to be certified asthma & allergy friendly® by the Asthma and Allergy Foundation of America, which means it’s been scientifically proven to reduce exposure to allergens and irritants, including pet hair in pet-friendly lodgings. For cleaning stairs, elevators, window coverings, vents, upholstery and other above-the-floor surfaces, consider Sanitaire’s QuietClean® HEPA backpack vacuum. It includes a sealed HEPA filtration system and holds a CRI Gold rating. Its 63 decibels of operating sound also meet LEED standards for day cleaning. Together, these products can help you deliver a pleasant experience for your guests. Visit sanitairecommercial.com/eon to learn more about the EON™ QuietClean® and EON™ ALLERGEN. All information listed in this section was submitted by Sanitaire®. Listen to Larry Fagan and Dave talk about the recognition of frontline staff members who make up any cleaning operation. What do you do to recognize your staff members? Larry is the second generation of Fagan Sanitary Supply and he has a lot to say about healthy, proactive cleaning and his journey to leave a family legacy. How Does Electrostatic Spraying Disinfect? An electrostatic unit does not “disinfect” anything. These systems are simply the means to apply disinfectants uniformly and comprehensively, meeting the EPA registered disinfectant requirements for dwell times and pathogen kill claims. Chemical disinfectants can achieve 99.999% efficacy rate with the proper dwell times. By delivering disinfectants via this method, adherence to EPA chemical recommendations can be achieved. By utilizing electrostatic technology and induction charging of liquid droplets to produce precise, controlled, high performance liquid disinfectant application, management capabilities for treatment of surface environments is achieved. Electrostatic application for surface disinfection is a method of applying EPA-registered disinfectants to a target surface area by utilizing electrostatic force of attraction. Simply put, the electrostatic system places an electrical charge on the surface of the droplets and disperses them across a target surface area, providing a comprehensive, even coverage. Consistent and uniform coverage of critical disinfectants is achieved. Disinfectant droplets adhere to vertical, horizontal, and three-dimensional surfaces, places where trigger sprayers alone could never deliver product. Watch this clip from Beyond Clean with Dave to understand more about how electrostatics work. What is Electrostatics in Cleaning? Electrostatics: is a branch of physics that deal with the phenomena and properties of stationary or slow-moving electric charge. · Induction Charging: Electrostatic induction is a method to create or generate static electricity in a material by bringing an electrically charged object near it. This causes the electrical charges to be redistributed in the material, resulting in one side having an excess of either positive (+) or negative (-) charges. · Coulombs Law: opposite electrical charges attract and like charges repel. First published in 1783. Most electrostatic application systems create an opposite electrostatic charge on the surface of the liquid droplets versus their targeted surfaces, thus create a super attraction, “Wrapping Effect”. Click here to go to the complete FREE course from the Academy. One of the most important skills necessary to run a profitable cleaning company is communication. Whether it’s talking with customers, prospective customers, lost customers or employees, the ability to communicate appropriately for the situation is a teachable skill and possibly the most important one to possess. it’s truly a people business. Without strong communicating skills, an owner will have difficulty getting information and training to employees, making presentations to prospective buyers, resolving difficult situations as well as issues, and ultimately will fall behind as the competition soars past. Knowing what to say and when to say it are skills which are developed with time and experience. When an owner comes into the business with strong people skills, this shortens the “learning curve” to effective communication. Whether it’s employee praise, reprimand, soothing an upset customer, congratulating an employee for a job well done, the ability to use the right tool (text, email, phone, in person) to deliver the right message is a skill worth the time invested to develop. Cleaning business owners who invest in industry education will always have an advantage over owners who don’t. Professional development never stops for those who are moving their operations forward. Certifications, continuing education credits, local workshops, seminars, national conventions, online learning are all ways owners can stay on top of the important trends and changes in the industry. One necessity in the industry is automation for your business. Automation saves money, time and increases productivity. From industry software to general financial accounting software, to individual tablet devices, today’s growing cleaning companies have to be at the forefront of technology and use the systems that can automate almost every operation. Many small companies or startups, hesitate to get on board with automation for one of 2 reasons. Either they don’t know what is available to them and are unsure how to use it or they hesitate making the investment in technology that they need to save money. In the end, they are costing their companies more money because systems and processes are antiquated and out of date causing lower productivity and increased labor costs.